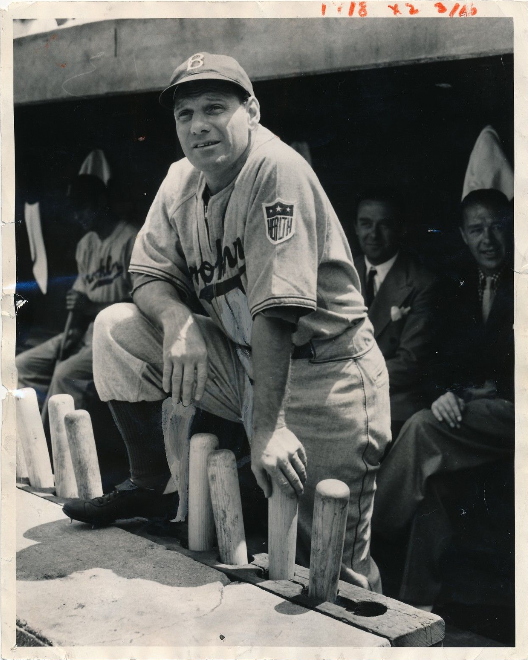 Here is another vintage press photo, dated in early June 1942 on the reverse, and it features Dodger skipper Leo Durocher on the dugout steps at Wrigley Field. Although the photo has numerous dates on the reverse it is June 8th that sticks out to me. This was the day the photograph was likely developed and printed. The Dodgers and Cubs had just finished up a five game weekend series over three days that included two doubleheaders, and the 8th was the first free day. I'd like to think the photo itself was taken the day before, though. The second doubleheader between the Dodgers and Cubs played on that Sunday, and by the looks of Leo's knowing grin you figure the boys did well. In fact, the Dodgers won both games of the doubleheader that day. Overall, the Dodgers won four out of the five games; having split the doubleheader that past Friday. Go here to check out the photo on eBay. Via Ken Gurnick at MLB.com, "Mattingly embraces big picture of recent shakeup." "I always remember Mark [Walter, chairman], Magic [Johnson, partner] and Stan [Kasten, president] in the very beginning saying they wanted to put a team together quick with a chance to win so the fans wouldn't have to wait five years while the kids on the farm matured, while at the same time, build the Minor League system to sustain the success year in and year out without bringing in a bunch of guys from somewhere else," he said. "So it's part of what they were talking about from the very beginning. Everything they said -- upgrading the stadium, the locker rooms -- everything they said they are continuing to do and this just seems like part of it." Via Ron Cervenka at Think Blue LA, "Could Andrew Friedman be Corey Seager’s ticket to the big leagues?" It probably safe to say that even though Friedman is the new kid on the block in the hierarchy of the Dodgers front office, he is (or will soon be) well schooled on Dodgers top infield prospect (and 2014 Co-Minor League Player of the Year) Corey Seager who, as we speak, is absolutely tearing it up in the Arizona Fall League – this in spite of his tender 20 years of age. Whereas Ned Colletti was always reluctant to bring kids like Seager up early regardless of how well they were doing in the minors, Andrew Friedman has a history of doing exactly that and his track record is very good in doing so. Via Jon Weisman at Dodger Insider, "Dodgers Adult Baseball Camp is less than three weeks away." Via Ken Rosenthal on twitter, Josh Byrnes is getting cozy with the Stan Kasten and is expected to join front office. Although, it appears unclear what position it will be. It could very well be that he joins the Dodgers in some capacity other than GM. In fact, there are several high-end executive positions open at the Dodgers; including DeJon Watson's old job as head of player development. Considering the location of this meeting in Arizona I think this is looking like the most likely scenario. Josh Byrnes with #Dodgers' Kasten at Fall League game at Camelback Ranch. Byrnes expected to join front office; position not yet specified. No! Wait? What? It's real? Holy Moly! The hoverboard is coming. Check out the video below of the Hendo Hoverboard and then go to their kickstarter campaign, here.